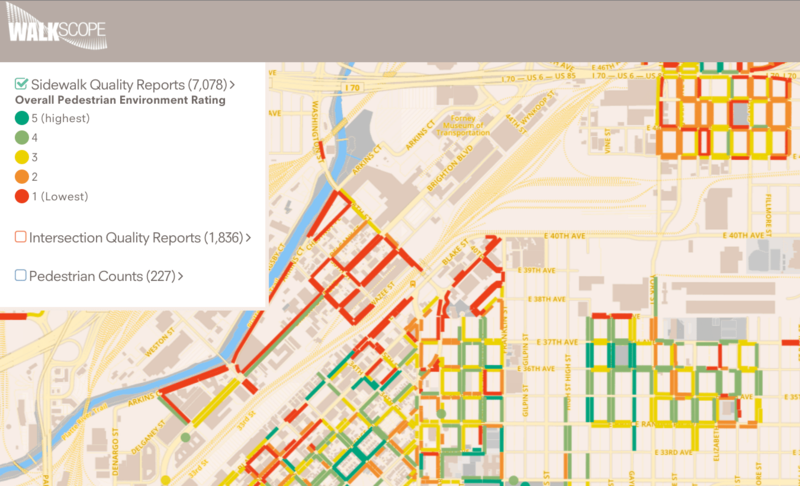 Give it up for WalkScope, the crowdsourcing tool that allows anyone and everyone to map the quality of Denver’s streets. Planetizen, a popular website about urban design and planning, has rated WalkScope one of its top 10 websites of 2015. WALKscope is the rare example of crowd-sourced public engagement that actually works. WalkDenver and PlaceMatters created the platform to engage the public in gathering information about the pedestrian environment in Denver. The color-coded map that results from all this collaboration quickly and clearly identifies the gaps in the pedestrian network. Unlike many platforms with similar goals, WALKscope is well-trod: 6,717 sidewalk quality reports populate the map, along with 1,817 intersection quality reports, and 227 pedestrian counts. The information is visible at specific locations as well as in the aggregate for the city. Not that anyone needs another reason to visit the beautiful city of Denver — but using this app to contribute to this cause seems worth a trip. The City of Denver doesn’t have a comprehensive inventory of sidewalk and intersection quality, making WalkScope a crucial tool to make walking and biking safer. Who better to record the data than the people who use the streets every day? Hat tip to WalkDenver, PlaceMatters, and everyone who contributed to the impressive amount of data. It’s a pretty intuitive platform that you can figure out solo, but if you want to become an expert on WalkScope or join organized data collection initiatives, check out the Community Active Living Coalition.